Editor: A controversial proposal to allow corporate advertising at the beach is moving forward through City Hall. The proposal to sell ads on lifeguard stations, walkway signs, trash cans, benches and whatever else is owned by the City could generate as much as $200K to half a mil, it is reported. In addition to ads, it is also being discussed to allow corporate murals. Councilmember Kevin Faulconer’s office has been on top of this issue. Yet, many in this beach community, at least, oppose such a blatant surrender to the whims of companies with the monetary power to buy their way onto the public property the City holds for the rest of us, and see this as a violation of the peace, quiet, and beauty of the coast and beaches. 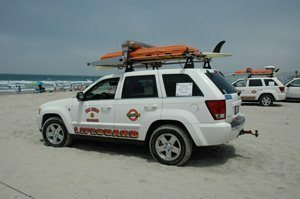 SAN DIEGO — Communities from Ocean Beach to La Jolla will have significant say in corporate advertising on their shores if a city proposal to sell sponsorships on lifeguard stations, walkway signs, trash cans and benches passes, a spokesman for City Councilman Kevin Faulconer said. The proposal, which could generate between $200,000 to $500,000 a year for the city, was discussed at a recent City Hall forum. Leaders from beach communities were invited to bring a guest to meet with Faulconer and city staff to learn about the plan. No deals have been secured yet, and community members would have a chance to sit down with potential advertisers, Faulconer’s Deputy Chief of Staff Tony Manolatos said. A San Diego City Council committee voted unanimously in July to move forward with a plan to raise money by selling ads that could be placed on lifeguard towers and other beach property. A San Diego sign ordinance mandates 85 percent of a sponsored city sign must be a public service message, and a corporate logo can only make up 15 percent. Manolatos said having corporate-sponsored murals was another possibility. Faulconer wants revenue generated from any ads to be put back into the community, Manolatos said. I am for it only if they let Budweiser and PBR put up signs saying Kevin Faulconer LOVES Carrie Nation. Ridiculous. I’m curious to know what “leaders” from Ocean Beach have met with Faulconer in support of this crazy idea. If you investigate please share.